I finally learned how to pronounce quinoa correctly so I figured I should now try to cook with it! I had been pronouncing it kee-no-wa for the longest time until someone looked at me funny and said "you mean kee-nwa?" Oops. 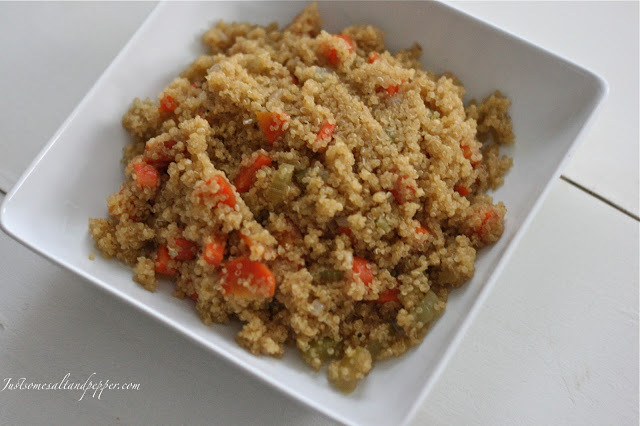 I found this recipe on Family Circle and thought it would be the perfect way to introduce quinoa into my diet. I'm not really one to make new year resolutions, but one of my goals this year is to incorporate more vegetables into my diet (along with drink more water). This recipe is packed with veggies and is perfect for vegetarians and vegans. 1. In a medium saucepan, melt butter; add carrot, celery and shallot and cook for about 5 minutes. 2. Add quinoa to the saucepan and cook for 1 minute; add vegetable broth, salt and thyme; bring to a boil; reduce heat to a simmer and cover; cook for about 20 minutes, or until liquid is absorbed. I like messing up the pronunciation just for fun! Haha. This looks tasty! YUM! I love how versatile quinoa is for cooking. Love your blog! Check mine out for similar, healthy recipes!